Randon Billings Noble's Be With Me Always, a PopMatters' Pick, is a quiet and at times profound search through secret places in the heart. The best non-fiction reading experiences seem to come through fragments of recognition. We might feel frustrated or confused at points, traveling through elusive passages and mazes with no obvious exit, but patience has its own rewards and thrills. No matter the gender orientation or ideological perspective of any given narrative, the strengths of good writing are contained within a universal awareness of commonality. That recognition factor is not always absolute, however, and it's rarely sustained long enough to be thoroughly dissected. We gravitate towards a certain volume not just because we might recognize the author's name or people within their radar screen. More often than not, we read these books for the glimmer of hope that our chance encounter with a slim in content but rich in context book of essays is enough to remind us that true brilliance comes both in the shock of recognition and the thrill of perfectly realized lyrical prose. Meticulously decorated rooms in beautiful houses are always treasures to behold. 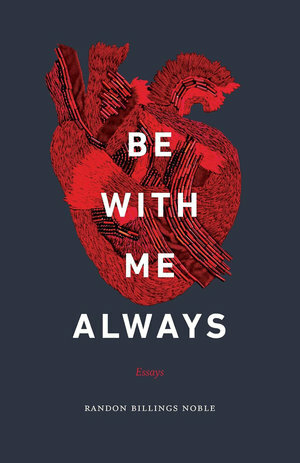 Randon Billings Noble's Be With Me Always is a tender, graceful collection of essays from a writer whose mission seems clear. Who are we within the context of our desires and longings? How do we function within bodies that are regularly changing? Through the process of viewing ourselves outside the shell of our beings, Noble does not seem to be suggesting that we can or even should live outside the limits of our corporeal essence, but we can try. Reading these essays is tantamount to dancing between lines of longing, looking without seeing, constructing and deconstructing our very essence, and understanding that nothing is really ever as it seems unless and until we see it again, with a fresher and sharper perspective. "I take two Tylenol with a large glass of water and think of our dissolution. How I held the sweet shell of you in my mouth, not knowing what bitter chalk lay beneath…"
"I will remind myself that I am the assembler -- and raw materials are everywhere." Drift to other sections of this book and the mission statement remains clear. In "The Split", the opening essay to Section I (entitled "Whatever Bed"), She's calm and clear in the face of catastrophe and separation. She considers the notion of the "split self", the defense mechanism we all undertake in order to cope and survive near-death experiences. She namechecks author Madeleine L'Engle's understanding of a non-intellectual belief in God. She mentions Sherwin Nuland's remarkable book How We Die (Vintage, 1995) and his awareness of human nature's ability to call upon endorphins to deal with states of tranquility in the face of imminent doom. For Noble, we all carry "…a small piece of mystery…intentionally inaccessible" that keeps us going. "Mirror Glimpses" is a prelude to the "Elegy for Dracula" essay in that both deal with interpreting the lies of perception. Nothing we see reflected back to us is every absolutely faithful. In the former, Noble reflects on her post-biopsy life, a time when she started to reclaim herself. "…I'm conscious of my thoughts and breath," she writes, "but it's the mirror that's really doing it." In "Elegy for Dracula", Noble concerns herself with the romantic allure of the title character as seen in Francis Ford Coppola's 1993 film Bram Stoker's Dracula. "When I first saw this movie…the idea of a dark immortality was immensely attractive…Dracula has the seductive powers of a confident man [and] the supernatural powers of an immortal." Noble goes necessarily deep here, discussing the root meanings of passion and passive, the inherent loneliness of the title character, contentment with the knowledge that she will marry a good man while also remaining aware that "…I will sometimes be haunted by the fleeting shadow of a figure in black." The final essay of this section, "Ambush", is a suitably dark coda to the idea of haunting figures, except this time it's for real. Her story of an epistolary relationship that devolves to something darker over the course of some years is effectively rendered. "He stalked me in college, but I was a willing victim… I wondered what lay beneath our carefully orchestrated conversations… What kind of game?" The thrill of a volume like this is how Noble doesn't seem to be insisting her essays be read in the order as presented here. The sections are logically curated, and the essays contained within clearly speak to each other, but they also communicate across the pages. In Part II, "Shadows and Markings", the final essay, "Marked", is a stunning meditation on the changes giving birth to twins will do to a woman's body. It's also about the deceptive consequences of looking without really perceiving. Noble writes about the time it took to heal: "It took days to peel away the glue… It took weeks for the stitches to dissolve… It took months for the scar to fade…" It's a methodical, gorgeous reflection on the myth of appearances as seen from the perspective of a mirror. Ankles reappear, incisions heal, a belly tightens, and the capacity to withstand anything proves remarkably elastic. Linger within Part II and read "The Shadows of the Hours", in which Noble imagines herself in the mix of Michael Cunnningham's novel about Virginia Woolf. She knows the doom inherent within Cunningham's tribute to a tragic life and she will not go down that road again. "I will want this second child," she writes. Creation and inspiration will continue. Woolf returns in the essay "Camouflet", from Part V ("On Looking"). Are there dangers in rambling and leaving the security of your room? In "Leaving the Island", she becomes part of Robinson Crusoe, "terrified to the last degree" about many things (including giving birth to twins.) In "Behind the Caves" she returns to her 25th high school reunion. "I did not care to dig beyond my cave," she writes, about her surprise that these people were not frozen in time as high school seniors, "and now it feels too late." "Strike a match and watch it burn. Strike a blow and crush the match. Strike a chord and burn with loss. Strike a deal and turn away." The title essay of Part V, "On Looking", is a humorous and touching reflection on (among other things) life as a student at a figure drawing class. We look at the model, but is our gaze ever returned? She wanders through Rembrandt at the museum and concludes that "Art shows me back to myself -- and me to you, and you to me." In "The Ownership of Memory" Noble wanders through Chancellorsville National Military Park and considers the ghosts of the fallen. She did not bring a camera but instead chose to record everything on paper. "On Silence" is the strongest essay in Part VI, "The Red Thread". Noble takes us into the quiet car of a commuter rail train, where she reminds us that we seek this section of the train because "…we want our ears to be our own and not used as a hole for other people's noise." In a section about the public library, Noble reminds us that such a place is really neither silent nor quiet. Writer Tillie Olsen comes into play here as Noble quotes her passage that "'…Literature and history and the present are dark with silences…" Go to cabins, cemeteries, and understand the difference between quiet and silence. "The ongoing silence after death is total," Noble writes, and any reader even remotely acquainted with this part of life will concur. Be With Me Always works its magic in profound, subtle, seamless ways. The meticulous craftsmanship in the construction of these essays is equally matched by Noble's beautiful, confident, assured vision.